Carnival Queens keeping cool in Brighton! In addition to being the coolest city in the UK, Brighton was recently voted the happiest city in England. No wonder the city receives a constant flow of day-trippers and weekenders from London. Basking on the Sussex coast, Brighton is less than an hour away from the capital by train. Many come for the simple pleasures of a stroll on the pier or fish n’ chips on the beach, but there is much more to this city than traditional seaside pursuits. 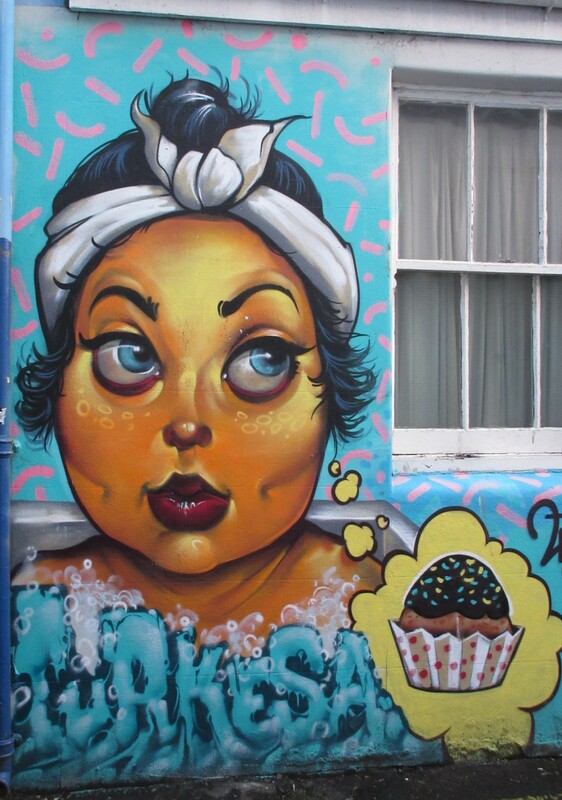 Brighton has a vibrant, alternative and quirky side, not always obvious to the day-tripper. My advice is to spend a few days in this colourful city and get under its skin. You won’t regret it. This area is often the first port of call for tourists. Brighton’s Palace Pier is the epitome of kitschy seaside fun and frolics. Amusement arcades, food stalls, cafes and bars are found on this Victorian era structure. All the fun of the fair awaits at the far end of the pier. Screams can be heard coming from the thrilling rides, and the combined aroma of hotdogs and cotton candy fill the air. To the west of the pier, pubs and restaurants line the promenade. In the summer evenings, it’s a popular chill out spot where visitors and locals hang out watching the sun sink over the English Channel. With a reputation as a womaniser and a gambler, the Prince Regent (later King George IV) spent much time in Brighton. He first visited in 1783 and this flamboyant royal was responsible for the city’s most recognisable landmark, The Royal Pavilion. The prince commissioned architect, John Nash, to design the ultimate party pad. The domes and minarets of the opulent palace appear to have been transported from the exotic east and randomly planted in the centre of Brighton. A combination of Indian and Chinese styles, the fantastical building is at once incongruous, yet fitting in this surprising city. 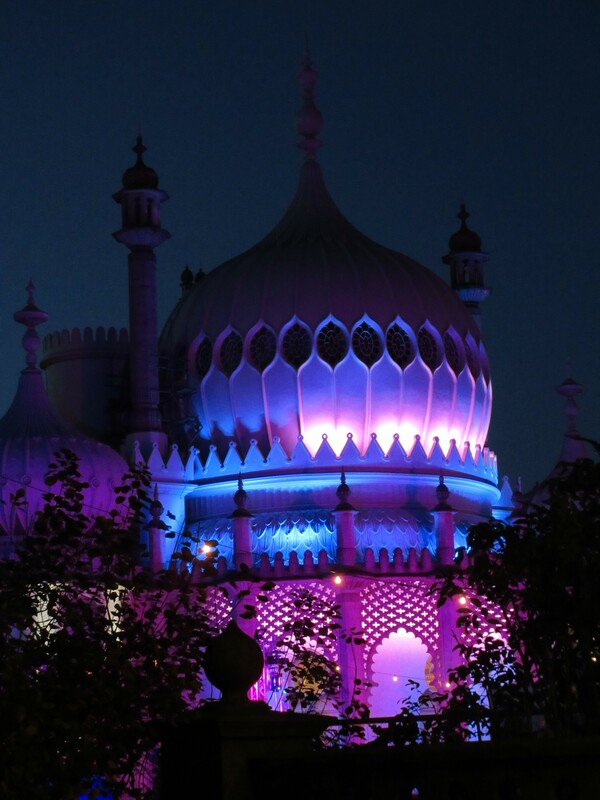 These days, the Royal Pavilion is a spectacular sight during Gay Pride, when it is illuminated in vibrant pink. During the festive season, an ice rink is erected in the grounds. On summer days, the surrounding gardens are a perfect spot for a picnic. Tucked between the railway station and the Royal Pavilion, The North Laine is overflowing with funky shops and quirky cafes. Here, in the labyrinth of streets, you can purchase anything from vintage and ethnic fashion to movie memorabilia or unusual gifts. Worth seeking out on the edges of the area, are some colourful examples of street art and impressive murals. On Saturdays, an antique and flea market is held on Upper Gardener Street, a great place to have a browse and soak up the unique North Laine atmosphere. Sitting outside one of the many cafes sipping on a Frappuccino, you may catch a glimpse of one or two of the city’s colorful characters. Small crowds gather to listen to buskers, adding to the ambience. If you want to get a feel for Brighton’s true spirit, head to the North Laine. The more southerly Brighton Lanes have a different vibe, but are equally as charming. Once the heart of the old fishing village, twisting alleyways and narrow passages lead to hidden squares. Antique and jewellery shops dominate, but as in the North Laine, there are some inspired independent shops and an abundance of places to eat and drink. Amidst the small shops, there are some interesting examples of four hundred year old fisherman’s cottages. The Druid’s Head pub, supposedly the most haunted pub in Brighton, is the ideal place for a refreshing beer before continuing your explorations of this fascinating area. The city has more than its fair share of exciting annual events. Brighton Festival held in May is the second largest of its kind in the UK. It is a celebration of art, music, theatre, dance, film and outdoor events. One of the highlights is when local artists open their homes to the public to exhibit their work. It is easy to spend a whole day wandering from house to house, with the occasional pause for sustenance at a nearby pub. A perfect spring day in Brighton! In early August, rainbow flags flutter throughout the city. Gay Pride kicks off with a glitzy parade through the streets and culminates in a huge party at Preston Park. The action then moves to Kemp Town, where festivities continue at a street party for the remainder of the weekend. Burning the Clocks celebrates the winter solstice and is a rebellion against modern Christmas excess. It is a magical display. A procession of residents carry over two thousand paper and willow lanterns through the city centre. On the beach, the lanterns are burnt on an enormous bonfire and a spectacular firework display ensues. Just remember to take a flask of mulled wine to keep you warm. The pace never slows down in Brighton. At night time the party people come out to play. To say that the city’s nightlife is diverse is an understatement. Whatever your scene, the city will provide. In gay Kemp Town, the drag queens belt out show tunes in the bars. Club Revenge packs them in with its choice of dance floors and beats. Back in The Lanes, Funfair is a club offering a burlesque/vintage seaside experience. With popcorn machines, distorted mirrors and roving snake charmers, it makes for a bizarre, but entertaining night out. On the seafront, Funky Fish is an unpretentious venue playing jazz, blues, funk and motown. Just the tip of the iceberg when it comes to clubbing options. 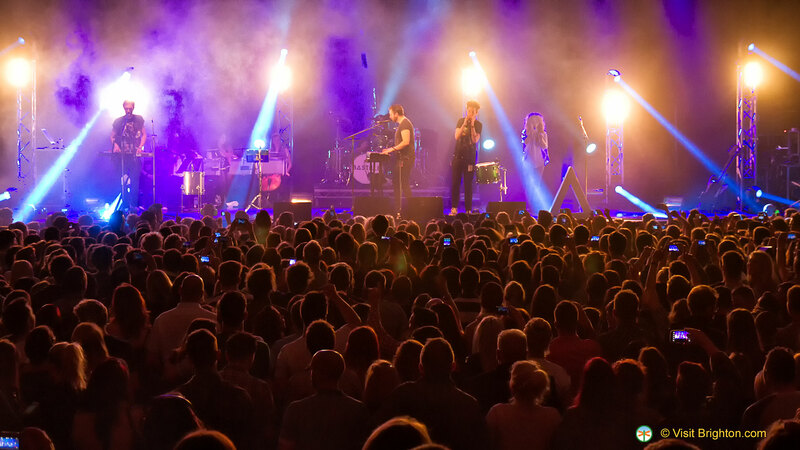 Brighton has an fantastic live music scene. From Brighton Centre where international artists draw in the crowds to obscure, but brilliant musicians playing in tiny pubs, every night of the week is alive with the sound of music. You won’t go hungry in this town. 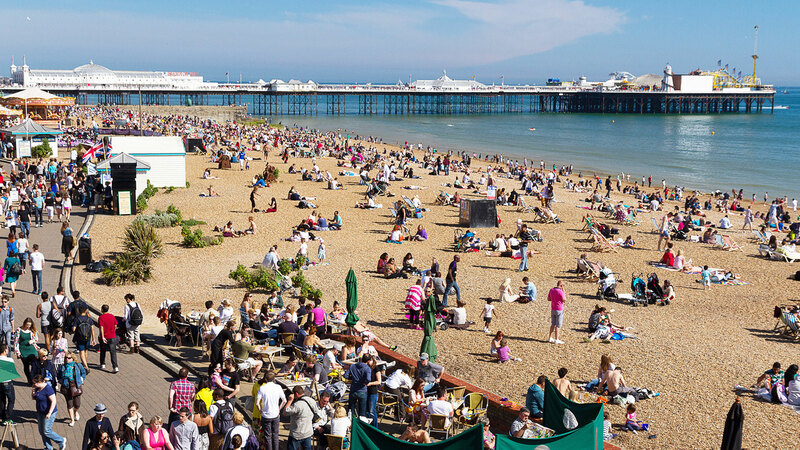 Brighton boasts the highest concentration of restaurants and cafes outside the capital. It is also has a reputation as a vegetarian mecca. Quirky tea rooms, hip cafes, fine dining or ethnic eateries……the problem is having too many choices! Restaurants galore – from street food to fine dining, Brighton has it all! True to Brighton’s alternative nature, local tours go beyond the customary bus ride around standard tourist attractions. One of the most popular tours available is a trip into the bowels of the city’s Victorian sewers. Hard hats and latex gloves are provided! Apparently, it doesn’t smell as bad as you would imagine and it is a fascinating experience. A Ghost Walk through The Lanes makes for a fun and spooky night out. Led by a guide appropriately dressed in Victorian attire, the ghoulish stories are entertaining, informative and spine-chilling! For maximum impact, take the tour after dark! The Funny Peculiar Tour focuses on eccentric characters who have lived in Brighton. A bizarre, but enlightening look at the people who have made Brighton the unconventional city that it is. Oozing with creativity, Brighton is a magnet for artists, musicians and writers, both local and visiting. Brighton Museum and Art Gallery houses both permanent and temporary exhibits, along with an interesting local history section. 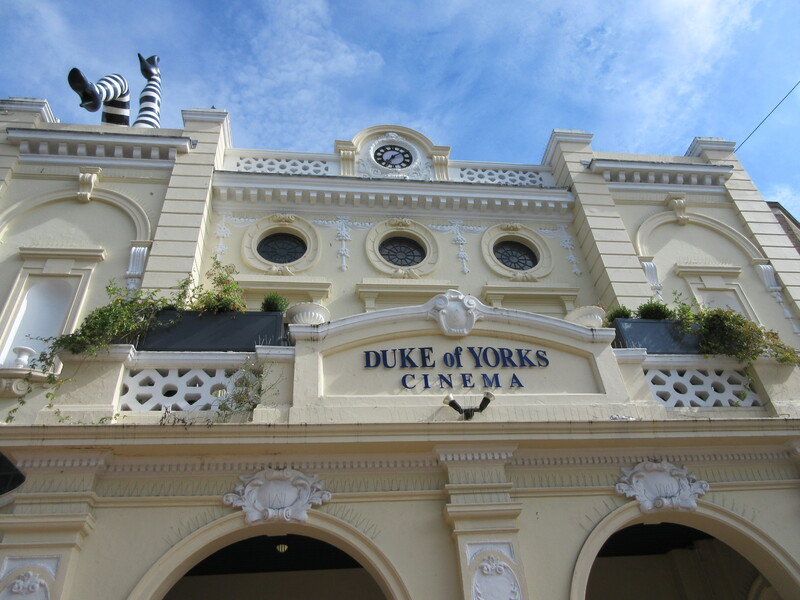 The Duke of York’s, which has been operating for over a hundred years, is an independent art house cinema which shows foreign independent films. The Komedia, situated in the North Laine, showcases a variety of comedy and music. There is also a cute little cinema attached, complete with comfortable sofas. 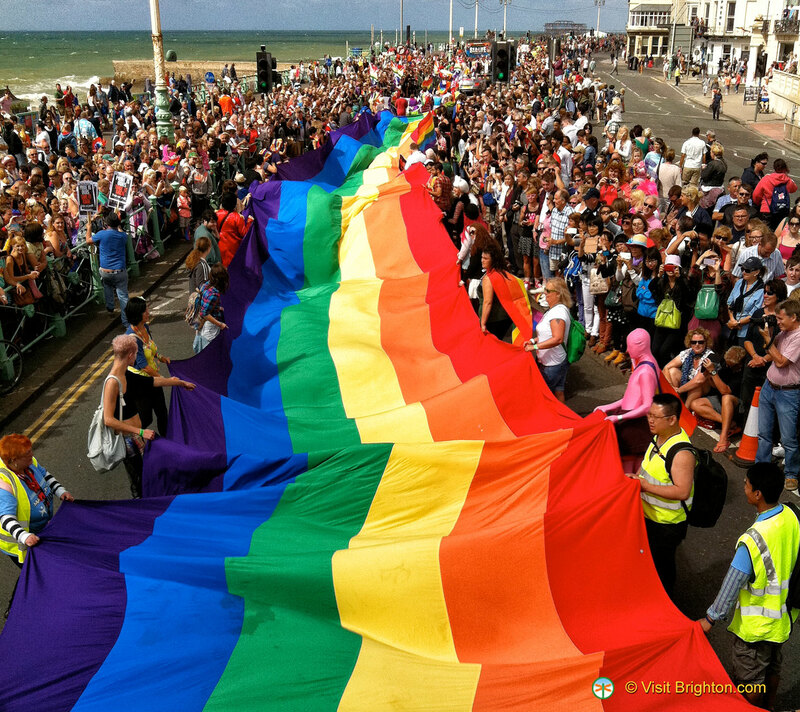 Year round, Brighton offers culture galore. Whether you are into poetry readings, contemporary art or Japanese drumming, it is highly likely that you will find something to your taste in this cultured city. 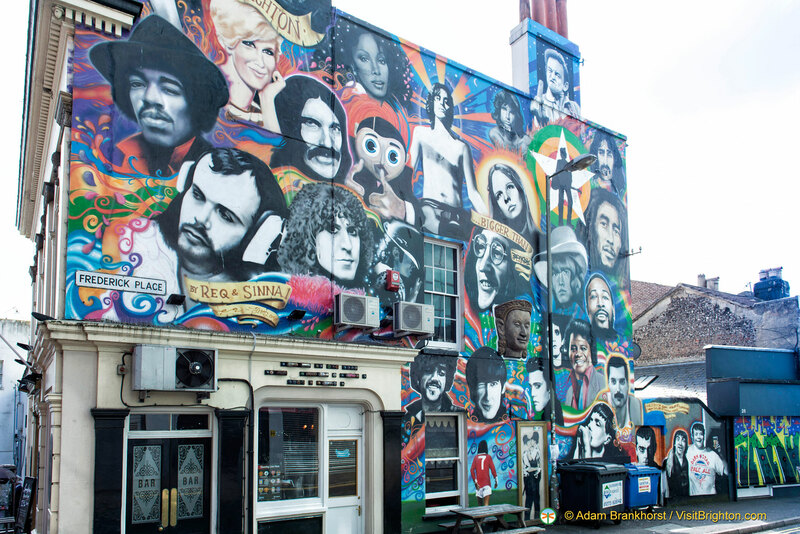 With over three hundred pubs and bars, Brighton is certainly not short of drinking establishments! Avoid the West Street area in the center of town, and check out the places in the North Laine, Lanes and elsewhere. In many of the gay bars, a drink often comes with free entertainment in the form of a drag queen. 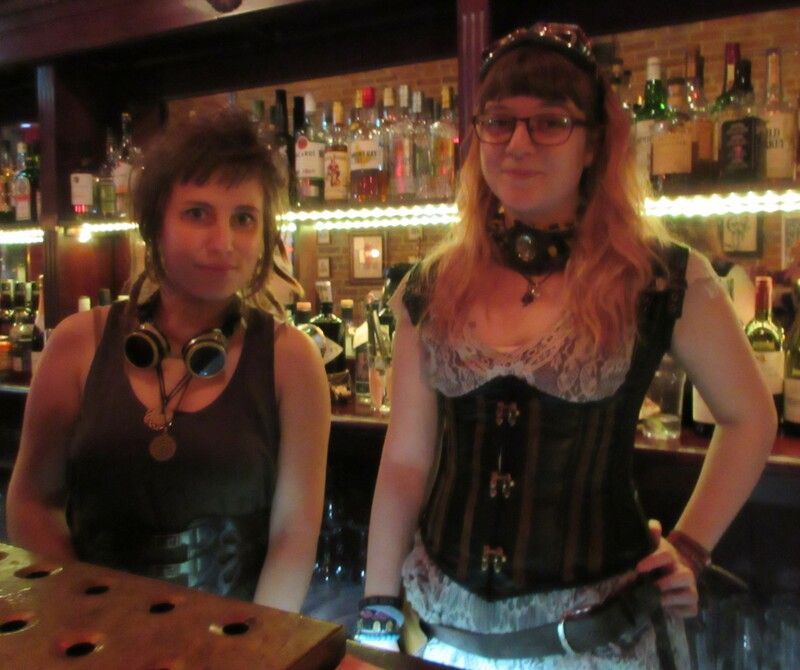 The city has recently become the first in the UK to have a Steampunk pub, The Yellow Book. It has a friendly atmosphere and the staff look the part in their funky garb. There are lots of hats to try on too! There are some awesome cocktail bars, including the well hidden Plotting Parlour and the rather exclusive Blanch House. With a bar or pub on every street corner, you don’t have far to crawl! o By Plane: Gatwick is the nearest airport. A taxi ride will only take half an hour or so. Trains and buses from the airport are frequent. o By Road: It takes about an hour by car from London, depending on traffic. A bus from Victoria takes a couple of hours. o By Train: Trains from Victoria and London Bridge Railway Station take up to an hour to Brighton. The Chilli Pickle – 17 Jubilee Street, BN1 1GE http://thechillipickle.com Indian food at its finest. The thalis served on railway trays are excellent. Warung Tujah – 7 Poole Valley, BN1 1NJ http://www.warungtujah.com A small restaurant serving tasty Thai food. Good value and friendly staff. 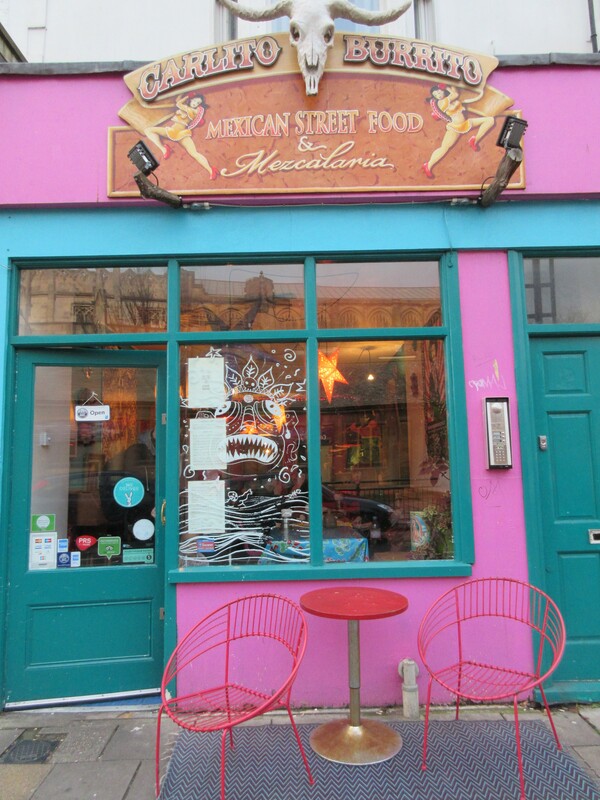 Carlito Burrito – 12 York Place, BN1 4GU http://www.carlito-burrito.co.uk A Mexican street food and burrito bar with a colorful interior and amazing burritos! Gars – 19 Prince Albert Street, BN1 1HF http://www.gar.co.uk Contemporary and stylish Chinese restaurant serving top quality and innovative food. Pho – 12 Black Lion Street, BN1 1ND http://www.phocafe.co.uk Vietnamese street food. Fresh and flavorsome. Planet India – 4-5 Richmond Parade, BN2 9PH Veggie, laidback, nice vibes and great value. The Yellow Book – 3A York Place, BN1 4GU http://yellowbookbrighton.com A steampunk inspired pub with a great choice of beers, ales and wines, and some cool hats to try on! Lucky Voice – 8 Black Lion Street, BN1 1ND http://www.luckyvoice.com Book a private karaoke booth with some friends and sing to your hearts content. When you need a drink, press a button and a waiter will appear to take your order. The Plotting Parlour – 6 Steine Street, BN2 1TE A cosy vintage ambience and fabulous cocktails. The Setting Sun – 1 Windmill Street, BN2 0GN A gastropub offering good food, a great choice of craft beers and great views from the garden. Drakes – 43-44 Marine Parade, BN2 1PE http://www.drakesofbrighton.com A luxury boutique hotel. Many of the rooms have sea views. The White House – 6 Bedford Street, BN2 1AN http://www.whitehousebrighton.com A tranquil retreat near Kemp Town. Hotel Artist Residence – 33 Regency Square, BN1 2GG http://artistresidencebrighton.co.uk Rooms are individually decorated by local artists. A long-term traveller who writes and blogs about her adventures as she makes her way around the world, Sue has been exploring the planet for thirty years and has no intention of settling down! While she loves hiking and camping in wild and remote places, Sue also enjoys the buzz and culture that cities have to offer. Check out her blog at Journey Junkies or find her on Facebook.